Liquid crystals are special substances that are usually liquid, but that show certain properties of a solid crystal. 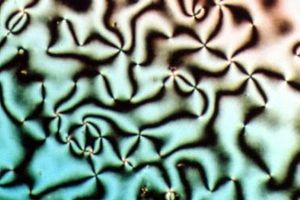 A liquid crystal (LC) may flow like a liquid, but its molecules may be rotated in a crystal-like way. There are many different types of liquid crystal phases. Different phases are different because their optical properties are different. Using a microscope and a polarized light source, different liquid crystal phases will have different textures. This is also shown in the image. The contrasting areas in the texture each correspond to a domain where the LC molecules are rotated in a different direction. Within a domain, however, the molecules are well ordered. LC materials may not always be in an LC phase (just as water is not always in the liquid phase: it may also be found in the solid and gaseous phase). This page was last changed on 9 March 2015, at 23:30.